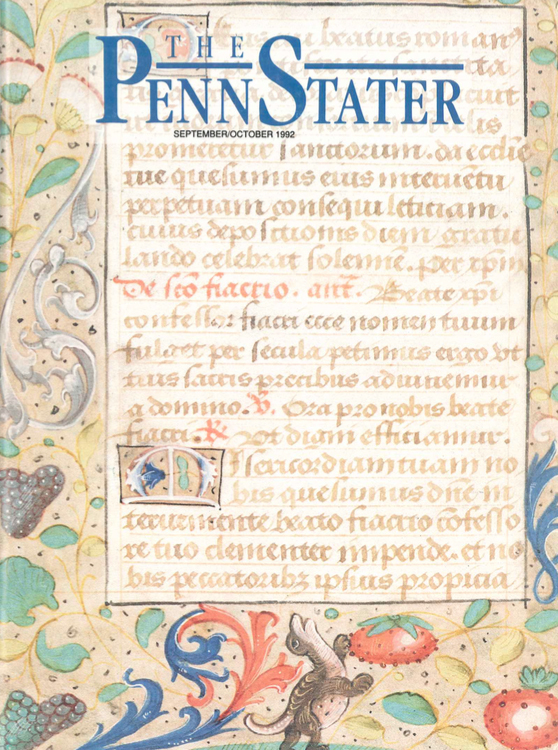 The cover of our Sept/Oct 1992 issue featured a hand-written, medieval “Book of Hours” from 1490. It resided in the Rare Books Room in Pattee Library, which holds a wide range of special publications and has featured things like original folios by William Shakespeare and a single leaf of the Gutenberg Bible. The collection has been built up in a variety of ways, from catalogs to fortunate circumstances, helping Penn State put together a room full of literary history. Also in the issue are features on the United States Cycling Federation Olympic Road Trials and National Championships in Altoona leading up to the Barcelona Olympics, forensic entomologists using insects to solve crimes, Dixieland jazz band The Tarnished Six, and the way communication technology impacts policy during wartime.